Contoso is planning to use the MIM to manage contacts in the corporation’s Active Director Domain Services (ADDS). The business has decided a select group of service desk people will be allowed to utilize the MIM Portal to create, modify and delete contacts in the MIM Portal and have those contacts created, updated, and deleted in ADDS. MIM Portal is authoritative for deletes and should be used for deleting contact objects. A delete of a contact in the MIM Portal will delete the object in AD. A delete of the object directly in AD will trigger recreation of the object in AD. We begin by creating the Contact resource in the MIM Portal. We now have to bind the attributes we want to use in the MIM Portal Contact resource. Next, we will create a new Search Scope for use in the search boxes of the MIM Portal. In order for the new Search Scope to be visible in the MIM Portal, we will need to run IISRESET to refresh the MIM Portal cache. You should see the inclusion of All Contacts towards the top of the drop down box. Do not attempt to create a Contact resource yet. You won’t be able to since we haven’t given the administrator the proper rights in a permission granting MPR yet. We now need to create a web page for creating, viewing and editing Contact resources. Find the file Configuration for Contact.XML that you just saved on the desktop and double click on it. Notice that this default XML file generated contains the definition of a Resource Control Display Configuration (RCDC) with web controls for all the attributes that the resource type Contact contains in the MIM schema. Edit the RCDC to only include Display Name, First Name, Last Name, and E-Mail. Select the check box Applies to Create. This will make sure the RCDC you are defining will be used when you create a new resource of type Site. Select the check box Applies to Edit. This will make sure the RCDC you are defining will be used when you edit an existing resource of type Site. Select the check box Applies to View. This will make sure the RCDC you are defining will be used when you view an existing resource of type Site. Open a Command Prompt and run IISRESET for the new RCDC to take effect. Next, we create a Set which has a filter condition based on the resource type we previously created: Contact. Description: Contains all resources of type Contact. We are going to create an MPR for the CONTOSO Support Desk team. Navigation URL: paste in the URL you copied earlier and replace the "http://...com" portion of the URL with a "~". Note the Contacts link should appear beneath Administration on the left navigation bar. Perform the next task to allow the MIM Synchronization Engine to see the new resource type and make it available for synchronization with other data sources. You should see a Select Resource window opening up with a list of resources that match Site. Select the resource which has a Resource Type of Resource Type Description. In order to see the new object type in the MIM Management Agent, we need to refresh the schema. 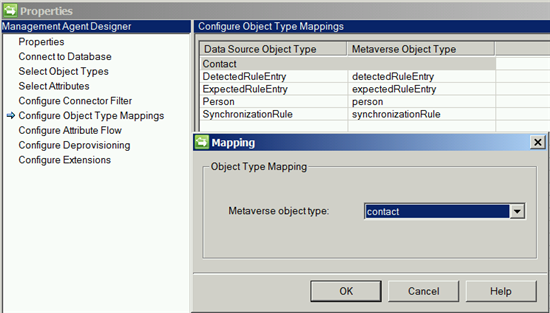 We will now create a Contact Metaverse schema object type. We will now go to the MIM Management Agent and map the Contact (Connector Space) object to the Contact Metaverse object we just created. Create workflow “AD Contact Provision Workflow” and add “AD Contact Outbound Sync Rule” sync rule. In the MIM Sync engine, click on Tools, Options, and select Enable Synchronization Rule Provisioning. Click on the Add link in the Status Pane to the lower left and verify that the test contact object was imported. Click OK You should now see contact objects in the metaverse and AD connector space. Run an export on AD MA. You should now see contact objects in ADDS.